So, when you have something to celebrate, what else can you do but have a little giveaway! But why have one giveaway when you can have two? First up we have a little bundle that I magicked up from my stash. The bottom two are FQs and the other four are just under at 20" x 16" each. Next, what would a giveaway from me be without some vintage goodness? A charm pack made up of 42 charms in 21 different prints cut from my growing vintage sheet stash. So what do you have to do to win one of these little piles of goodies? Simples, just leave a blog post saying what you'd prefer to win, NEW or VINTAGE? Would you like a second chance at winning? If you follow me (either here or on Instagram) just let me know in a separate comment. That's it! Of course I'm happy to post internationally. How did I miss your news?! Congratulations! Lovely giveaway - new for me, please! and I follow you on Feedly! New - they would make adorable zippered bags! oh love the new bundle! Vintage. I have fallen in love with that brown/pink floral vintage print on the top right of the picture. Beautiful fabrics! I would prefer new but either is really cool! Its a tough one! new please! Love the vintage. Probably since I qualify as vintage now! And just started following you on bloglovin! I would love the vintage, those patterns are gorgeous! Thanks for the giveaway! The vintage please. New you can get any day of the week ! I love the vintage! But really the new is so pretty too, I just have never worked with vintage. Thank you for the chance of winning! I'd be happy with either new or vintage. Your choice! Thanks for allowing us access to your stash - I'm not brave enough or ruthless enough. i like the new best. i like the new prints. I love them both but I'm trying to get some things together for a 30's quilt and the 1st (new) would work wonderfully in my plan! The new is cute! I really like the patterns! I'd have to choose new, although they're both great! Ahh they are both great! I guess I would choose new, but I would be pleased with either! I would love the NEW fabrics. Thanks for the giveaway! Definitely Vintage! It just gets better with age! I would usually say new, but the vintage ones are way too gorgeous! So I'd pick those! and I follow you on bloglovin. Thanks again! I really like the prints in the new bundle. I follow you on bloglovin (Sandy Hardman). I love the new fabrics. Vintage for me! Love it! I like the top bundle best. Have fun with your giveaway! I love them both but I think I'd choose the new because then I could use them in my double wedding ring quilt. Although they're both pretty, I love vintage fabric. Vintage for me. I'm starting to collect vintage sheet scraps, and these squares would be a great addition to my stash. I would probably go for new. I don't have any vintage fabric. Oh, they're both lovely! I do love those new prints, though! Thanks for the chance to win! Love both, but would choose new. Thanks for the great giveaway. I think I'd have to go with the vintage. I love the prints!! That was a cruel choice... after debating with my husband, I will say vintage! I follow you on Intsagram, thank you so much for the giveaway! As a charm-a-holic, my charm box would love some vintage company! Come visit my giveaway, too! definitely new for me, I'm not good with vintage. thanks for the chance! The new fabric for me please! I have so much vintage fabric that I must build a stash of new fabric now. Thanks for the giveaway! I love the NEW bundle of fabrics. Thanks for sharing lovely fabrics from your stash - that's the ultimate kindness! I'm a new follower via Bloglovin & Instagram, thanks. 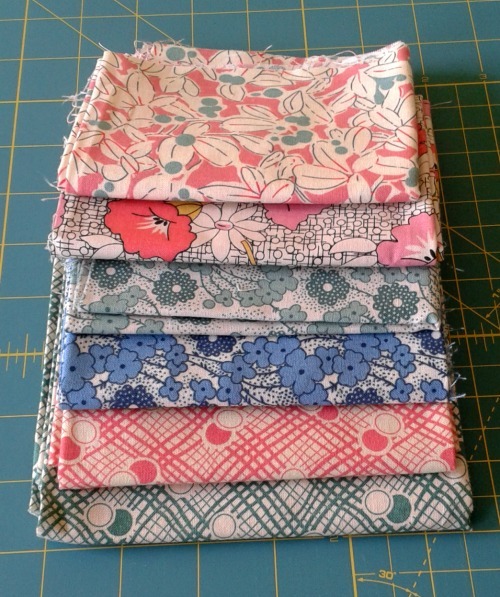 I love those retro feedsack prints, they are unlike anything I own, but they are wonderful! Since I am a little vintage I will go with vintage , thanks for the chance . I am a new follower on bloglovin . I'd prefer Vintage, but both look beautiful to me! I'd go for the new. Thanks! I follow you with Instagram as kluckingbear. Thanks! Congratulations!!! So exciting! I'd choose the new bundle -- but they are both great! NEW... or no, VINTAGE... I really don't mind, I'd be thrilled to win any fabric! ...and I follow you here through Bloglovin, and on IG, too! I'd love to have the new fabrics! Thanks! Wow - you have some great stash fabrics going on there. Guess I would choose the new fabrics - they would blend with some I already have! OH put me down for vintage. I envy your stash I have several vintage sheets sets myself and love the feel of them. I follow on blog lovin Thanks for the chance - New or Vintage. Both would be nice. Either type would be great. The vintage is nice as it's already cut into charms, but the new are larger so perhaps more flexible. Thanks for the chance! New, please. Love those wonky plaid designs. Thanks for the giveaway. I love the vintage. I would love to win the vintage! I follow Patshyn Catrin on bloglovin. New, please. Great giveaway. Thanks so much for sharing. Vintage. Thanks for participating in the Giveaway Day. I follow you via bloglovin'. Thank you for a fun giveaway! I will choose.... New please! thank you!! following on bloglovin also! thank you again! I love the vintage!! Thanks so much for this great giveaway! Love both but I'd have to go for the vintage!! Both options are great, but I'd prefer the new. Ps-congrats on your news from yesterday. Would like to win vintage. I have a quilt top started in vintage fabric so I need some more. Thank you. I'm following now in IG @agalinsweden ! Ohh, Lizzie, I agree! I love the new -- wonderful 1930's prints! I'd love to win the vintage. :) thanks for the great giveaway! I'd say the new 30's prints :) And congrats on the new incubation! the new is great because it's kinda vintage too! Thanks for a giveaway! 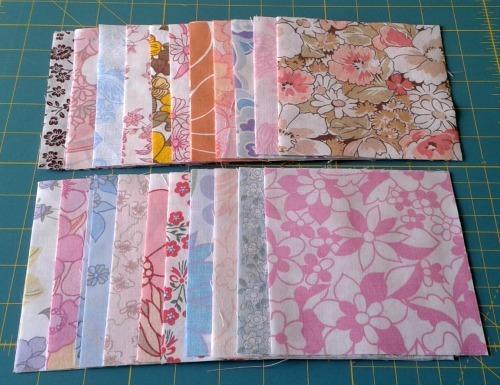 Although I love vintage the charm pack would be perfect as I am doing a quilt that requires a lot of 5 inch squares. So hard to choose! I'd say vintage. i think i like the vintage set best. I can't choose! I like them both. New is awesome, but I could work the vintage into a project I have coming up ! So pretty. I signed up to follow you via BlogLovin'. I love them both -- can't decide! Whatever the other winner doesn't want! I have my own vintage sheet collection so I think I would go with new but either one would make me equally happy! I would love to win some vintage! Thanks for the chance! Congrat to the little one on the way. I am going to pick new. I know a lot of quilters like the vintage collection but I will still choose new. Thank you for being a part of the Sew Mama Sew giveaway and giving me the opportunity to win. I would love the new - thanks for the chance! OK, let's try that again! I love the NEW fabric! Crossing my fingers for a lucky number on Friday!